INTEGRA has released a new application note that demonstrates how combining its MEDIAJET Petri dish filler with the DOSE IT peristaltic pump provides an optimised automated solution for the production of high quality blood agar. The quality of blood agar plates is of prime importance for the reliable determination of haemolysis type - a common technique in medical diagnostics to classify Gram positive cocci. High quality agar plates have a typical light red colour - a characteristic feature of intact erythrocytes. Agar plates with lysed red blood cells appear brown coloured, a feature that complicates the reading of haemolysis pattern. To avoid spontaneous lysis of erythrocytes, it is important to keep the temperature of the agar as low as possible. In addition to minimise cell lysis, the time the blood remains in the hot agar has to be as short as possible. Meeting these requirements is a challenge for most laboratories. The new application note describes an automated protocol that minimizes the time that the blood is exposed to hot agar medium and thus efficiently reduces thermally induced lysis of erythrocytes. 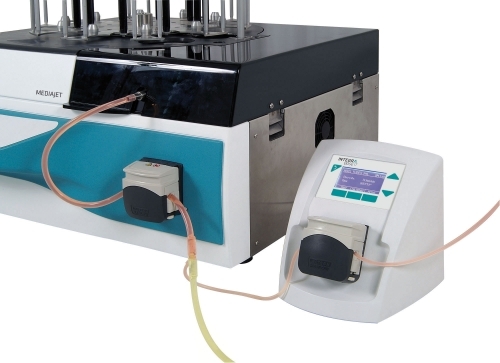 By preparing the blood agar using an INTEGRA MEDIACLAVE media preparator, the dispensing temperature can be set and maintained at low temperature. Furthermore by combining the MEDIAJET Petri Dish filler together with a DOSE-IT peristaltic pump and a special tubing set for blood agar the experimenters were able to add blood to the agar immediately before pouring the plate thereby reducing blood cell lysis significantly.